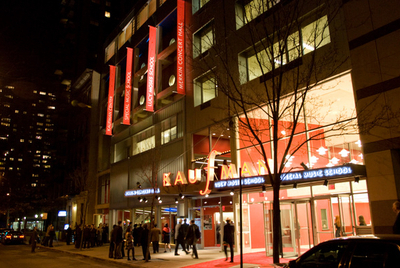 Kaufman Center or Kaufman Music Center is a notable performing arts complex in New York City that houses Lucy Moses School, the Special Music School, and Merkin Concert Hall. Originally known as the Hebrew Arts School, it was founded in 1952 and is currently located on West 67th Street between Broadway and Amsterdam Avenue. More than 75,000 people use the Center annually. Kaufman Music Center was founded by Dr. Tzipora H. Jochsberger in 1952 as a community school for pre-conservatory music training. Located at 129 W. 67th St. on Manhattan's Upper West Side, today's Kaufman Music Center is home to Merkin Concert Hall; Lucy Moses School, New York's largest community arts school; and Special Music School (PS 859), a K-8 public school for musically gifted children. First known as the Hebrew Arts School for Music and Dance, the school moved to its permanent home, the Goodman House, on W. 67th St. in 1978. Named after Abraham Goodman, the building was designed by Ashok Bhavnani in the Brutalist style and received the Albert S. Bard Trust Award for excellence in architecture. Merkin Concert Hall opened its doors in 1978, and in 1991 the organization was renamed the Elaine Kaufman Cultural Center in recognition of a major gift by Elaine and Henry Kaufman. At that time the Hebrew Arts School was renamed Lucy Moses School. 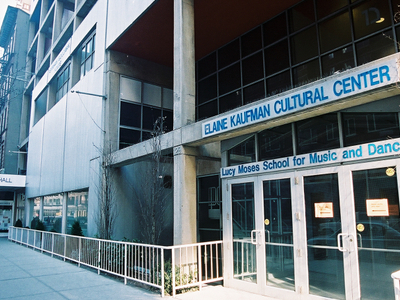 In 1996, Kaufman Music Center partnered with the New York City Department of Education to open Special Music School/PS 859, a K-8 public school for musically gifted children. Major renovations by architect Robert A. M. Stern in 2007 significantly improved Merkin Concert Hall and the exterior of the building. Architect Robert A. M. Stern oversaw the 2007 renovation of the lobby and balcony levels, as well as a drastic overhaul to the exterior. “The Kaufman Center is kind of rough and tough, because of the Brutalist aesthetic of the building. It’s a powerful building, with good, strong bones, but it’s a little short on grace notes.” Most noticeably, a new marquee unifies the entrances to both Merkin Concert Hall and the two schools. "It visibly unites under one marquee all three parts of the Kaufman Center physically and psychologically,” Kontos remarked. Here's the our members favorite photos of "Concert Hall near Upper West Side". Upload your photo of Kaufman Center! So far only Ahmad Syahir wants to visit Kaufman Center. Do you want to visit Kaufman Center Click here?